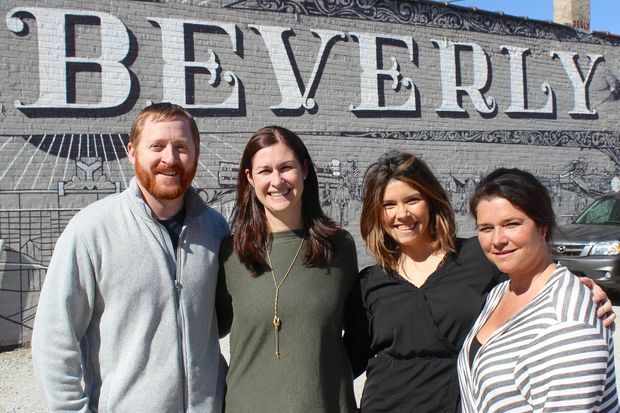 Kevin and Karen O'Malley (left) will open B-Sides Coffee + Tea in August at 9907 S. Walden Parkway in Beverly. Megan Barba (third from left) and Katie Schickel (right) own the nearby Tranquility Hair Salon and are also planning to find a like-minded user for the storefront at 9911 S. Walden Parkway. 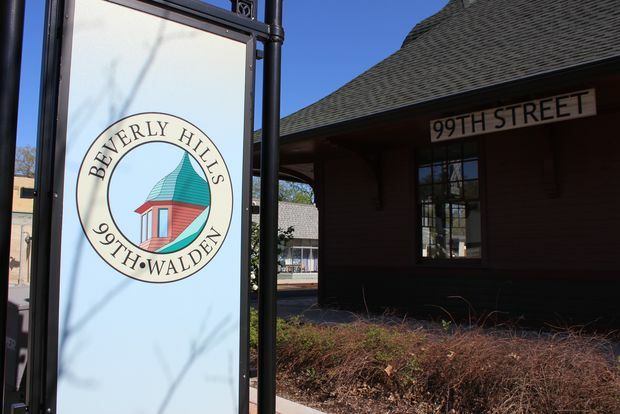 BEVERLY — B-Sides Coffee + Tea expects to open in August at 9907 S. Walden Parkway in Beverly — the first of many changes coming to the shopping district near the 99th Street Metra depot. The coffee shop will replace Figlia Boutique, a gift store that has operated near the commuter train tracks for the past six years, said owner Becki Speedwell, who plans to close the store to focus on her business online and at pop-up shops. Meanwhile, Kevin and Karen O'Malley will open the music-themed coffee shop that will cater to morning commuters. The Beverly couple also frequent the area as parents of an All Day Montessori student. "I think it all started with us being everyday Rock Island commuters," Kevin O'Malley said of his 900-square-foot coffee shop. The coffee shop will sell Metropolis Coffee, a popular North Side brand as well as Rishi teas. All the while, vinyl records will play in the background of the shop that will be open from 6 a.m.-3 p.m. Mondays-Saturdays, said O'Malley, adding that Sunday hours remain undecided. "The B-side of an album is like a hidden gem," Kevin O'Malley said of the name for his new coffee shop tucked within the quaint pocket of Beverly. The store will be designed so that customers can walk into the front of the store and exit out of the back with their drinks to immediately board the train. And besides commuters, the O'Malleys believe parents at their daughter's nearby school as well as customers of Tranquility Hair Salon, Beverly Barre and others will frequent the coffee shop. Sweet Freaks is also moving its candy shop to 9927 S. Wood St. in Beverly — taking over a larger shop just east of the Metra tracks. The new storefront will allow the owners to produce their gourmet candy on site, said the owner of the building that also houses Pelar Construction. Maura Conine will replace the candy vendor at 9915 S. Walden Parkway with a women's clothier. She'll be handed the keys for the 700-square-foot shop June 1st and expects to be ready to open sometime in September — after Labor Day. Conine, a Beverly resident, plans to call her store Capsule. It will stock a small variety of versatile clothing designed to be mixed and matched based on the individual's lifestyle, taste and more, she said Monday. "It's about thoughtful, edited selections," said Conine, who previously worked for Nordstrom as well as Beverly's Belle Up. Meanwhile, Megan Barba and her sister Katie Schickel took over the storefront formerly occupied by The Blossom Boys at 9911 S. Walden Parkway in January. The flower shop closed after eight years on Dec. 24. The owners of Tranquility Hair Salon aren't exactly sure how they are going to use the storefront across the street from their salon at 9908 S. Walden Parkway just yet. They have toyed with the idea of creating some sort of event venue or a shared offices. Regardless, they said the storefront needs to work well with the surrounding businesses to help build a vibe of cool, walkable shops that Schickel said she's seen around train stations in suburban Western Springs and elsewhere. "We just have a vision for our block," she said.